Recently two of our product departments were recognized by vendors in their area. From left: Emily Echola, Timon Cooney, Jerry Lippert, Diane Sutton, Jerry R. Henry, and Alan Baierl. 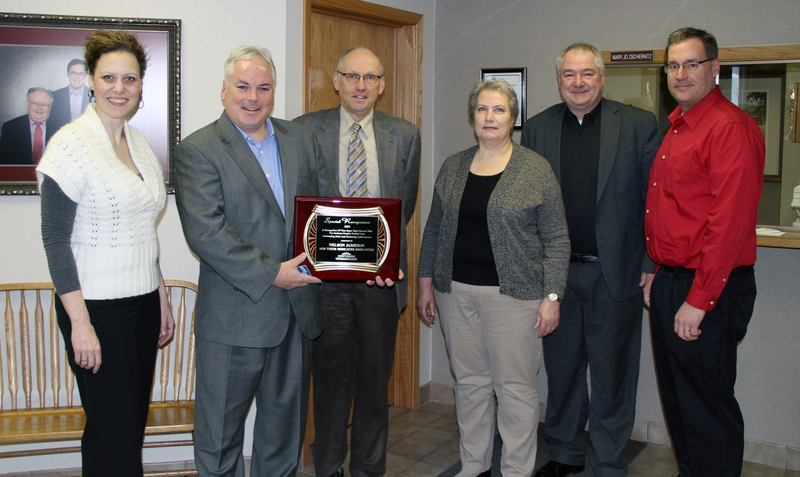 Nelson-Jameson’s Process Systems Department received the 2013 Outstanding Sales and Marketing Achievements Award from Saint-Gobain Performance Plastics for work with their sanitary coupler product line. Accepting the award (from left to right): Emily Echola, N-J Process Systems Department Manager; Timon Cooney, Saint- Gobain District Sales Manager; Jerry Lippert, N-J President; Diane Sutton, N-J Process Systems Product Manager; Jerry R. Henry, Saint-Gobain National Sales Manager-Process Systems; Alan Baierl, N-J Assistant Process Systems Product Manager. Also in the Process Systems Department, not pictured: Alan Piller, Al Rasmussen, Bob Oertel, Ed Rhodes, J.R. Banks and Traci Burkart. From left: Josh Sabo, Mathew Bartkowiak, Ph.D., Jenni Yetter, Steve Zdun, Fritz Buss, Kelly Zirbel, Lori Deiler, and Cathy Laube. 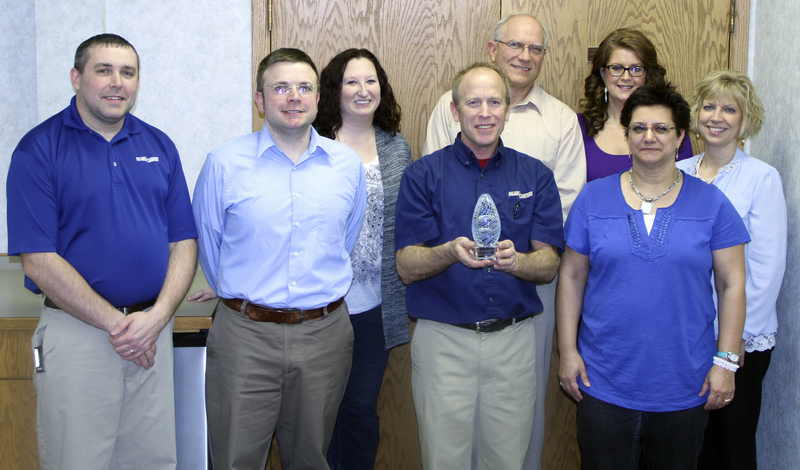 Thermo Scientific Orion awarded Nelson-Jameson’s Laboratory Department with an Outstanding Distribution Partner Award. Top 5 Year Over Year Sales Performance as measure by low net ranking for dollar and percentage growth. Participation in Sales and/or Marketing Programs. Active collaboration and partnership throughout the year to drive revenue and improve customer experience. With the award (from left to right): Josh Sabo, Department Assistant Manager; Mathew Bartkowiak, Ph.D., Department Manager; Jenni Yetter, Product Administrator; Steve Zdun, Service Technician; Fritz Buss, Technical Director; Kelly Zirbel, Product Administrator; Lori Deiler, Buyer; and Cathy Laube, Product Manager. Congratulations to our product management teams! 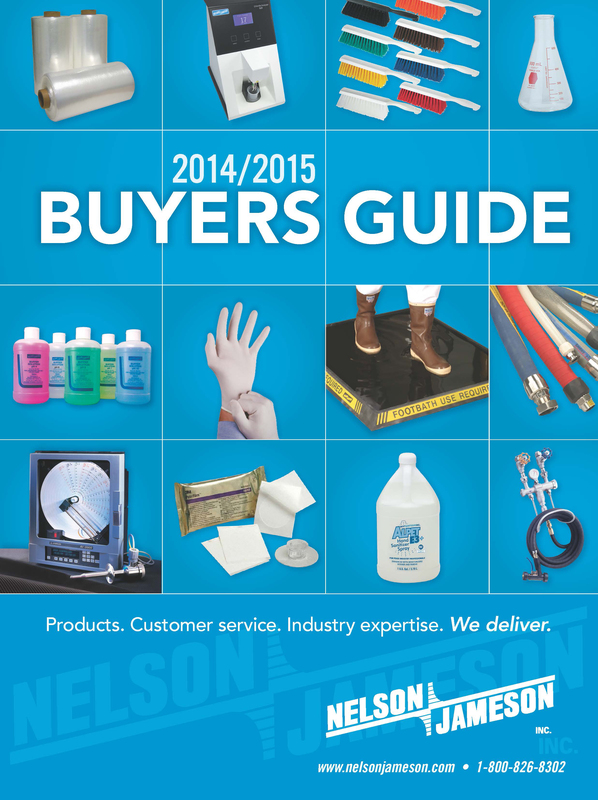 MARSHFIELD, WIS., June 5, 2014 – Nelson-Jameson, Inc. announces the release of the much anticipated 2014-2015 edition of their Buyers Guide. Customers will notice that the new edition includes more than 50 additional pages of new and innovative products for the food and dairy industries including expanded offerings in the popular color-coded and metal detectable product lines. 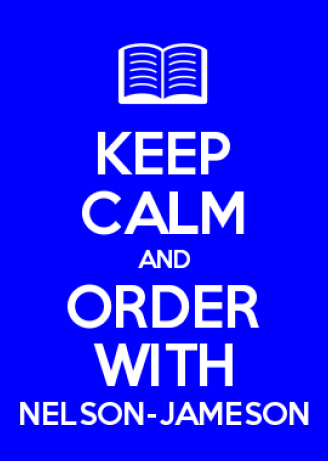 The easy-to-use “How to Order” boxes, terminology, and other guides were expanded to help provide customers with a one-stop source to find the right product for their applications. The newly designed color-coded insert also includes eight additional pages of products to expand Nelson-Jameson’s already extensive color-coded offering. In an effort to give customers even more options, Nelson-Jameson now has many more color-coded products available in pink. The catalog offers many hard-to-find and specialty products exclusive to Nelson-Jameson, as well as hundreds of supply items used daily. 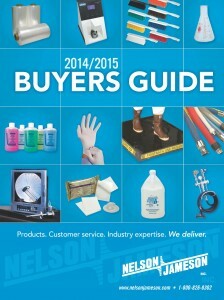 Customers can request a FREE copy of the Nelson-Jameson Buyers Guide by calling 800/826-8302, or visit nelsonjameson.com. 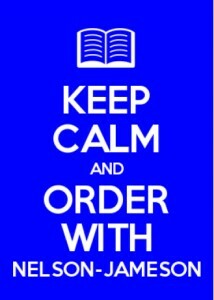 I’m sure that many of you have seen the latest fad of clothing and accessories with the “Keep Calm” phrase. I created this one because I thought that this really fits with our launch of the new 2014/2015 Nelson-Jameson Buyers Guide. First, I would like to say Kudos to all of those that were involved with the catalog! I’m sure that many of you feel the same way that I do when we hear the buzz about the launch date of the new catalog. EXCITED! Waiting to be handed the new Buyer’s Guide takes me back to my childhood memories of waiting for the JCPenney Christmas catalog to come out. For those of you who are too young to know this JCPenney had three catalogs yearly that were about the same thickness as the Buyer’s Guide. They had the Spring/Summer and the Fall/Winter and of course the one that everyone looked forward to especially if you were a child was the Christmas catalog. This catalog was filled with beautiful toys. Any toy that you could imagine. Of course when the catalog came in the mail I was so excited to see what was new. I would open the book and just admire the beautiful pictures of toys and the children that were smiling in the picture playing with these toys. Just like all the other children lucky enough to get a catalog I started to make a list or circle things that I liked. But, a good lesson that I learned each year after not seeing my favorite toy under the tree was just like the Rolling Stones song, “You can’t always get what you want. But, if you try sometimes well you might find you get what you need.” At Nelson-Jameson, we strive to do just that -help our customers find what they need! Recently, many production facilities and states are banning the use of mercury thermometers within their labs making the spirit-filled units more popular. Many times when these thermometers are shipped they do separate within transit. The most commonly used method to re-join the liquid is to gently tap the thermometer above the separation point in an upright position. Should this not work here is another little trick. Boil water and place the thermometer in the boiling water, flip it upside down to remove any air bubbles that may have formed, then reinsert it vertically into the boiling water and your organic material should be rejoined. Lastly, to avoid separation always store your spirit-filled thermometers in an upright position. For more information, contact our Technical Sales Department at 800-826-8302.